Learn why regular reviews of your productivity system are so important and how OmniFocus can help you establish a highly-effective review practice. An overview of the key components of a productivity system. Why reviews are so important and the consequences of not doing regular reviews. Strategies for getting into the habit of performing regular reviews. How to ensure that all elements of your system, including both physical and digital inboxes, are included in your reviews. Why it’s so important to review your calendar on a regular basis and how OmniFocus can help you establish this habit. How to use create self-completing, repeating projects in OmniFocus that support you in systematically performing reviews. What to include in daily and weekly review projects and what to make a single repeating action. How to create a “To Review” perspective to quickly and easily identify everything that is ready to be reviewed. How to make effective use of OmniFocus’ built-in Review perspective. How to use reviews as an opportunity to tap into your creativity, with some help from your someday/maybe lists. Get Clear — Gather everything that has your attention and process your physical and digital inboxes to zero. Get Current— Review and evaluate your projects, single action lists, waiting lists, and longer-term goals and outcomes. Get Creative — Review your someday/maybe lists and unleash your creative prowess. Essentialism: The Disciplined Pursuit of Less by Greg McKeown — Essentialism is a thoughtful, practical book that dispels the myth that we can have it all. Instead, it recommends that we put our time an energy into pursuits that are essential, and cultivate a practice of saying "no" to the rest. GTD Weekly Review® Reference — The David Allen Company provides a free PDF that provides an overview of the GTD Weekly Review. It's recommended that you watch the recording of the Start Smart with OmniFocus session, whether you're new to OmniFocus or an experienced user. In addition to showcasing OmniFocus' features on Mac, iOS and Apple Watch, this session provides a review of best practices and recommended conventions. 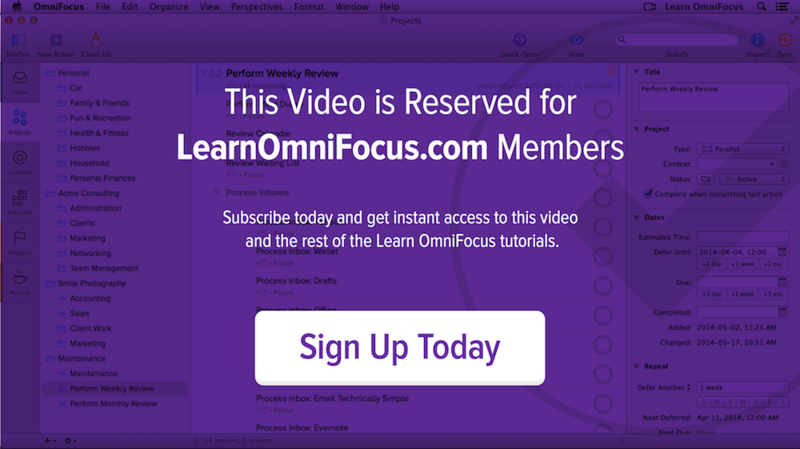 Also check out OmniFocus: Beyond the Basics to delve further into OmniFocus' feature set. Among other things, you'll learn how to create and edit perspectives on both Mac and iOS (Pro Edition).